Decisions, decisions! 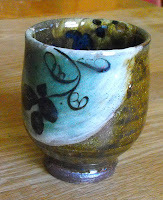 I have to ship 5 cups Monday for the Yunomi Show at AKAR. Will you help me pick? Here are some casual photos I shot. Leave a comment and let me know which 5 you would send. Thanks a lot. the exhibition "to have and to hold"
Here are some pictures of the exhibit "To Have and To Hold" at the J. Michael Kohler ArtSpace Gallery. Thanks to Amy Chaloupka for sending the pictures of the show. It looks fantastic. I wish I could have gone to the opening, but Wisconsin seems so far away! 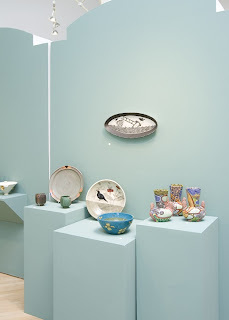 Other exhibitors include my friend from the Asparagus Valley Potters Guild Francine Ozereko, as well as MN potter Jeff Oestreich, fellow blogger Diana Fayt, California research chemist and artist Katherine Dube, and NH potter Megan Bogonovich. 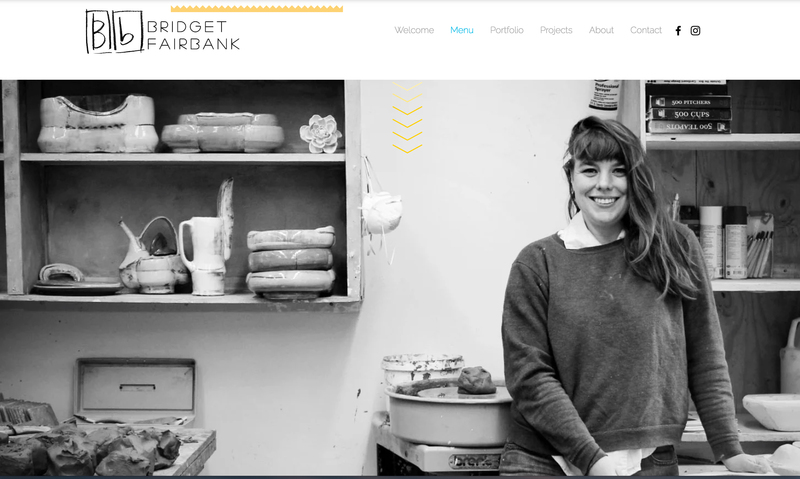 Here is the link to the ArtSpace website with info on purchasing work from the show. If you live in the area check out the show for me. The show will be up until April 5th. This morning I had coffee with my friend Buzz Coren, who is a woodworker in nearby Celo. He was telling me about his new work that he recently launched. It reminded me of the swirlware I have been making. It' multi-layered custom dyed veneer! This line has been designed expressly for Red Hatters. Buzz lives nearby and we had coffee together this morning. Check it out here. Are you a Red Hatter? For those of you without laptops or with very stiff necks, here is Tom Turner's fine mug in it's correct orientation. It wasn't an anti-gravity mug after all! While at Tom's yesterday I spotted these other pots. 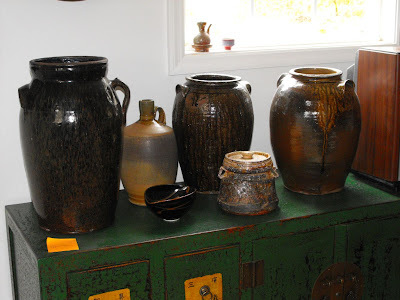 This little group of pots sits by Tom's ding room table. Can you guess which one of these pots was not made in the USA? Tom posing in front of one of his "American Onggi". Tom insisted on me posing with the jar to give you a better sense of scale. If these jars could talk...well, maybe Tom can tell the story one day. 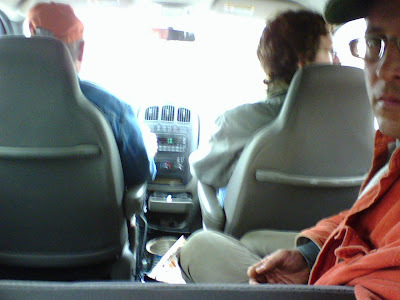 Just like a bunch of high school boys skipping school, Tom, Matt and I were out driving all over Madison and Buncombe County while all the other potters were diligently working away in their studios. 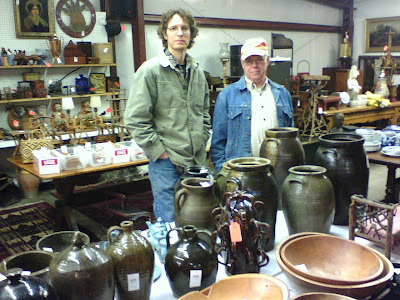 Instead of drinking cheap beer, doing donuts in gravel parking lots, and getting into trouble we were looking at old pots. Ah, times have changed. It was a perfect day and I thought I would share a few pictures of our travels. I took these pictures with my phone, I apologize for the sub par quality. 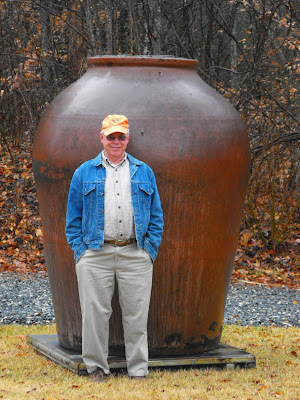 Tom also took us over to see the location of the old Reems Creek Pottery that was run by George Donkel. We saw the pottery site and the beautiful two story house he lived in. 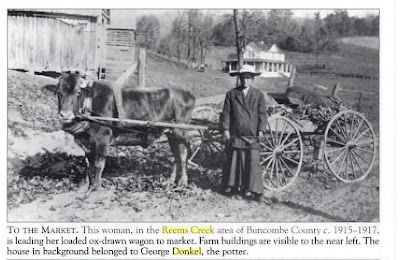 I didn't take any pictures but found this interesting picture courtesy of Google books. Well that all for now. It's late and it's time for for some much needed rest. After all, I have to go back to work tomorrow! I love this MUG! I'm pretty sure I've shown this before in my coffee break series, but not in full color. 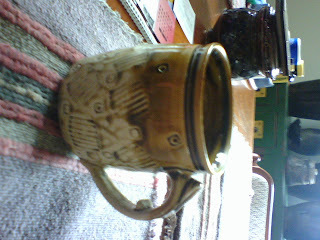 Part of the reason I love this mug so much is its beautiful and hard to pinpoint color. Is it green, is it brown? 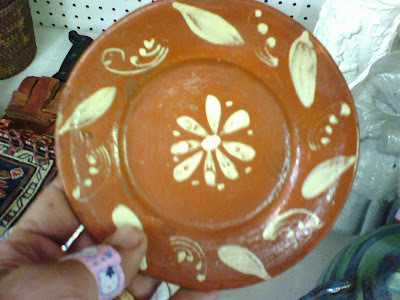 It's certainly the color of Catawba pottery at its best. The texture of the runny glaze makes me think of Kim's stoke doors and how I got one stuck when I first helped him fire his kiln, and how I was glad I had two layers of pants on that night. You have dull red heat, you have your bright cherry if your a blacksmith, but you have the burning zipper temperature when you're burning a groundhog kiln. 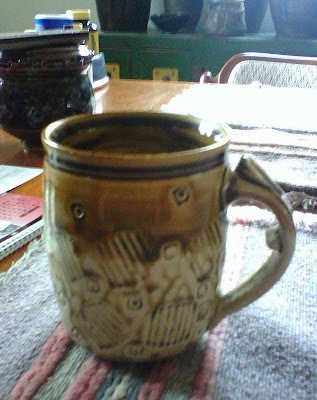 This mug has a nice pool of alkaline glaze in the bottom confirming the hot fire from which it was born. I like the comfort of the handle and the slight flare of the rim. I got this mug from Kim the first time I met him several years ago and I treasure it to this day. And now for something completely different! As I looked over my treasure trove of a hard drive I found this video of Ron Meyers painting a fat rat on a big platter. It's incomplete and filmed on my cell phone, but here it is for your viewing pleasure. A frosty mug for ya! 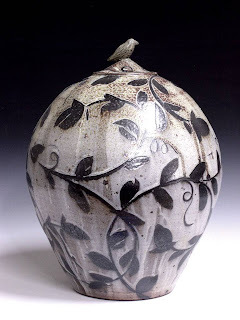 This is a special room-temperature micro-crystalline glaze. Just leave your pot outside (not underneath roof) on a cold night. 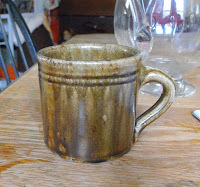 Unfortunately this glaze is very unstable and melts when you either pick it up or when you fill with any liquid. 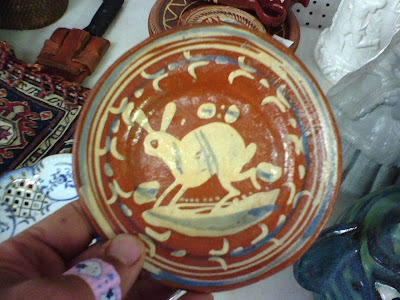 If you find yourself asking "why would someone leave such a beautiful piece of pottery sitting around on a saw horse?" have no fear, it has a great sense of balance! 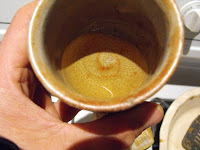 Emily Murphy posted an interesting post about coffee stains yesterday, and as I was reading it (last night), I noticed the SPI cup I was drinking my scotch from had a beautiful stain, as well. I've had thousands of cups of coffee outta this one over the years (not quite a thousand scotches). Beauty is in the eye of the beholder, as 'they' say, and I must say that this was one of the most beautiful bisque firings we've had in a while. Or maybe it's one of the only bisque firings we've had in a while, or maybe it's been a while since 'we' had a bisque firing, or maybe something funny was in the biscuit I ate this morning, or maybe there was something funny in that stuff 'they' call coffee at Hardee's of Spruce Pine...Here is a picture of some of the results, before they get all mucked up with painting, glazes and such. Ah.....innocence! Loading a bisque kiln (still on my front porch) today. I thought about loading all the greenware onto the tobboggan and riding'em down hill, well....better not. It's time to "put childish things things away". 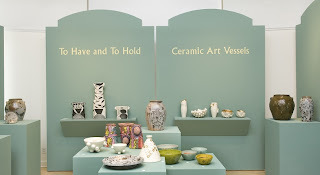 Besides I need those precious few pots for the "You Know Me" Show. Now I must thaw out the glazes and get ready for the paintin' and glazin'. 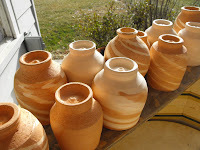 Then I'll run'em up the road to Courtney's wood kiln to load'em! 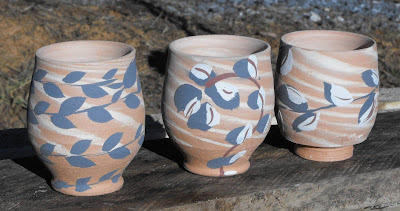 Here are a few of the cups that I've been working on the last couple of days drying by the woodstove, in hopes that they will be ready and there will be space in Courtney's kiln by weeks end. 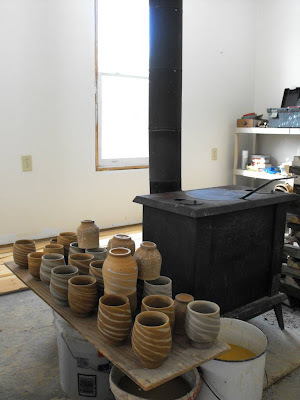 It's been great to make pots in the shop with wood heat. It's been a long time since I've had the pleasure of being absolutely cold waiting for the fire to get going in the morning and on the other end realizing that it was so hot that I needed to open a door! Ahhhh. I'm not complaining. 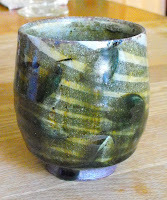 I also wanted to share with you the "chuck" I am using to cut the feet on my swirl/twirl cups/yunomi. I got this idea from Mark Shapiro, who has probably made a gazillion teabowls over the years. I remember the hundreds we would load into every kiln load at Stonepool. 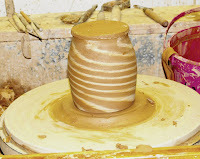 The center dosen't really support the cup, but, instead, keeps it from flying of the wheel if it comes loose from it's clay moorings. Ideally the clay pad is soft enough and the rim size of the cups are relatively the same size and a little trench emerges as you use it. Unfortunately it also dries a little bit as you go on. I just go back and re-wet it from time to time. Since all of the cups were of varying sizes I had to make my chuck to fit the average size. Like many of these pottery processes, cutting the feet, getting good balance, visual and otherwise, is hard to get without repeating the cycle a few times. Just as in throwing each new pot gets you closer to an ideal, cutting these feet was a little disappointing, and I wish I had thrown a few, then trimmed a few to get all the notes right the next time around. I threw all of these cups before i had trimmed a single one. Doing the swirl added a complication. 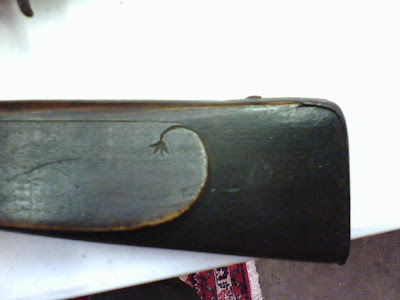 Since the swirl is essentially inlay, trimming away the feet cut most of the inlay away. I tried leaving the outside untoached in some cases, but I wasn't exactly happy with the weight, etc. So decisions had to be made, heads did roll, or something like that. Anyway, to the drying unit and hopefully bisquing and glazing in the days to come. 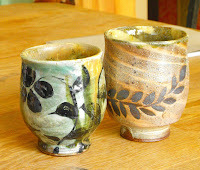 Here are a few cups I made last night with three different clays. The gray is a stoneware, then there is my red dirt stoneware, and the white is a white stoneware. Looks fine now, but we'll have to see how contrasting the clays are when they're fired. 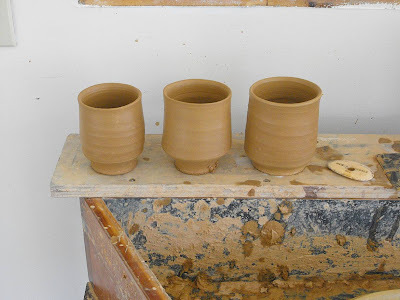 The clays have to be the same hardness/softness or I get smearing, like in the two cups at the right. The red dirt was real soft. I really can't express how great it is to be making pots. The kick wheel, the table and the floor to wedge on are all I need for now. Although the studio is not quite set up with tables, wedging or otherwise, I rushed in to make cups for the AKAR Yunomi Show. I thought I would just grab some clay and go to it. Ha! It wasn't exactly a square wheel of momentum, but maybe a hexagon. I managed to get some clay processed, kneaded, and ready to go. I moved some wood working tools to the side, and hunted down my favorite ribs and my "special" sponge, and off I went. I threw a couple of boards of warm ups and culled half of them. Then last night I got to a point where I was ready to 'twirl'. I want to make sort of a NC meets Japan cup. 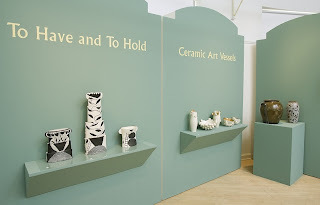 Not exactly a new idea, but innovative pottery making isn't always about inventing a new technique or finding a new material. Mostly it's a just a matter of carrying the ball a little further down the field, keeping an idea alive. Just as humankind has eaten food of one sort or another since the beginning of time potters have made pots and some things just work. 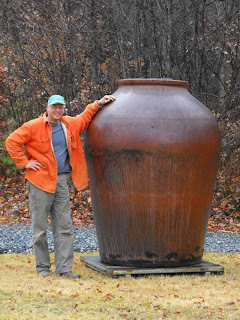 Getting the size and shape right is infinite in its possibilities, but some pots have a certain vibrancy, life. So the quest is on! 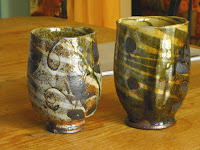 Here are a few of the swirl cups I've made on Saturday. 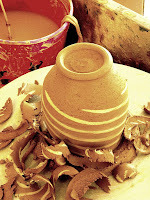 It was all about the twirl and how it came around the pots and remembering how to do it. 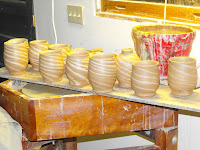 The process of making these pots is time consuming and hopefully worth it. Part of what took so long was the MeTube crew that kept getting in the way and slowing things down. [I wonder if anybody is working a clay proof camera?] If I am so lucky I will have time to edit the hours of footage down to a reasonable video. During all of the click clacking on the treadle wheel I was thinking that I've really neglected it, using it almost exclusively for cutting feet. 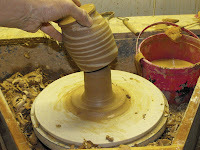 There is a nice feel and torque on the clay and it was just right for the twirl ware. 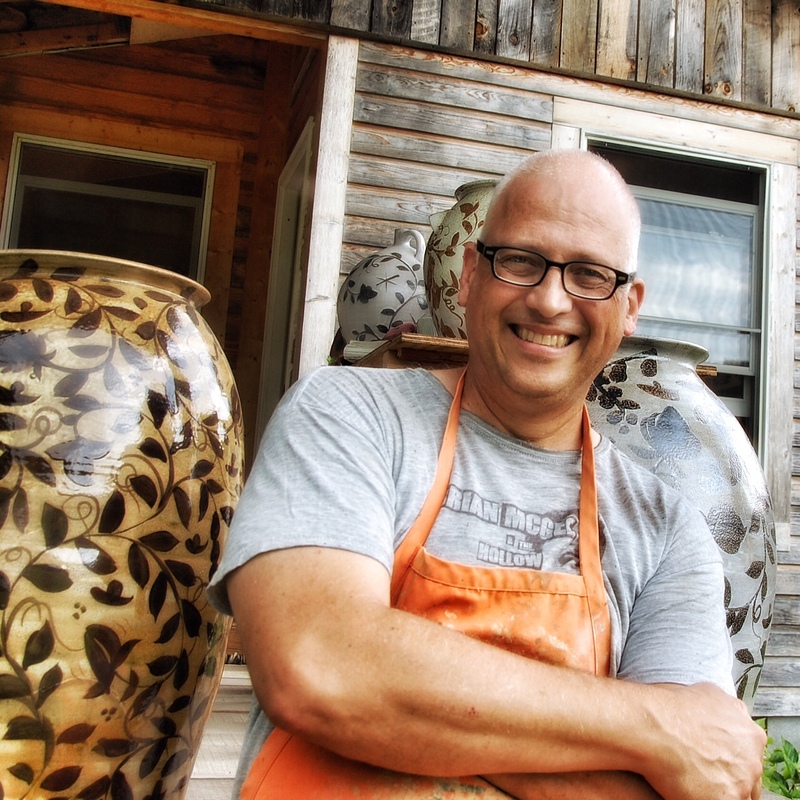 I also reminisced about working in Mark's (Shapiro) new studio, the fall of the Berlin Wall, and making pots in MA in 1989. I thought about the Kloppenstein(?) 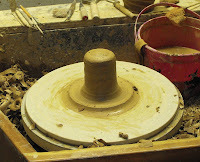 wheel I used in college and the first potter I saw make a cup, Steve Frazier, a grad student at TN in 1985. Many things go through my mind as I work, thoughts, of course, about what I am doing with my hands. But also memories of pots, people, and places. I was thinking that "here I am, making pots and not wearing a tool belt full of nails and screws!" With that I bid you all a fair and peaceful Sunday. As cold as it might be here in the mountains of North Carolina, the shop was warm and cozy inside. 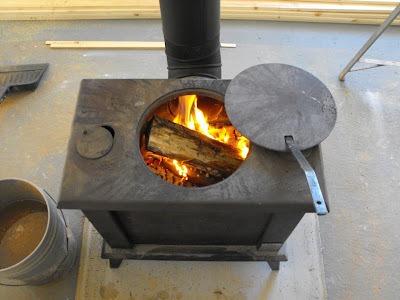 This is a stove I got from Ron Meyers about 8 years ago. 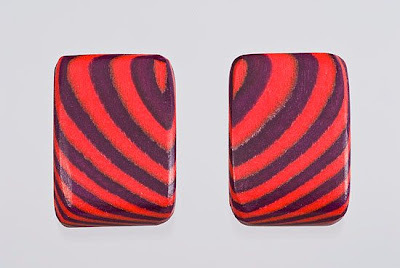 I traded some pottery and a pair of Stacey's earrings for it. Not bad. It's been heating our home ever since and now will keep the pots warm at night. 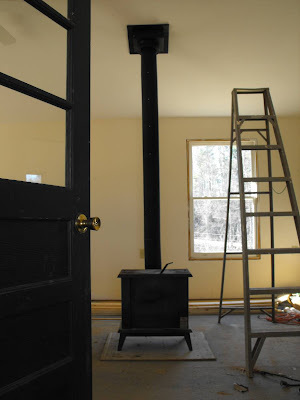 It's Temp Wood stove, made in Adams MA, not far from where I lived in Worthington, MA. 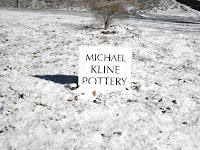 As a matter of fact Mark still uses one in the shop at Stonepool Pottery (aka, Stovepipe Pottery, or Stone Fool Party) . 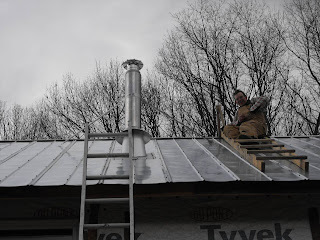 Thanks to Micah Cain, who helped me "raise" the pipe into the flue and fit it. There is heat! As I was saying in a previous post, the situation down at the house was thankfully resolved without incident, but the problem persisted in the pottery shop. No water! Oh, no plumbing! Oh, I forgot, there isn't any. So I went down to my runoff barrels down by the kiln shed roof and found the water in the barrels unmovable. RATS! (again) After chipping enough out to fill a barrel and scrounging, I mean sponging, enough out of my thawed reclaim buckets, I managed to get enough for my throwing pail. It was a poignant moment since I hadn't thrown any pots since September , I think, and just as a tear was welling up in my eye, my iPod blasted Badfinger's "Baby Blue" in my ears. Did you really think, I'd do you wrong? 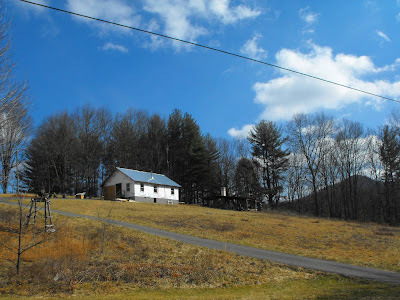 This picture was taken about 11:30 a.m. after I had spent a considerable amount of time under the house thawing pipes and finally realized I had left the well cap uncovered. As Ron and Dan might have said, "RATS." Although I had left the water dripping last night in anticipation for the "three dog night", I forgot that the well was left uncovered after I used the hose a couple of weeks ago to clean up the chicken coop. Cynthia Bringle recorded 0.3*F at her place near Penland. You all were very thorough with your guesses, Wow! But nobody has gotten it yet. Maybe another clue? Nahh. 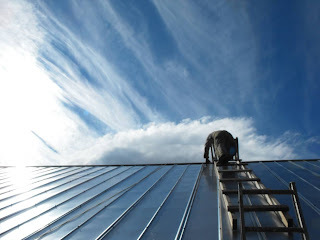 Here is my neighbor Buck Pollard scampering up the roof to work on the chimney. 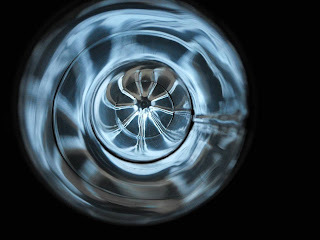 I took the photo in the previous post from inside the studio looking up through the stainless steel chimney liner! It was quite a kaleidoscopic vision. I had to get a picture of it before everything was sealed up. What looks to me like a fancy tire rim on a low rider is actually the rain cap on top of the chimney reflecting on the inside of the chimney. The beautiful blue sky provided the light! Here are Buck and the chimney later in the afternoon, just before it began to snow. I'll post the answer sometime on Wednesday. I came across these pots from yesteryear as I was backing up some files. 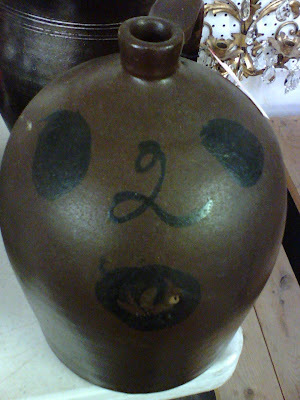 I like the ovoid shape of the lidded urn. The vine design seems believable. I also like the bird perched atop the lid. 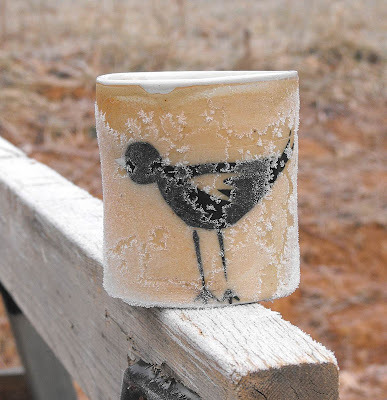 The salt glaze on the wax resist is thorough. This leafy branchy pattern on this pitcher fits nicely. 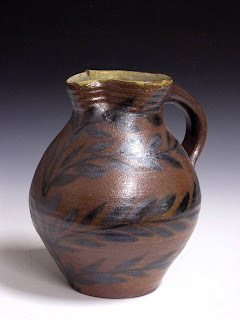 I like the color of the bare clay with black slip and salt glaze. It's a combo that I don't use very often. The shape is alright if not expectable.